Two holiday flavor have come together, gingerbread and maple and have created these delicious cheesecake bars with a gingersnap crust. I love anything maple flavor, if I see a cookie or a pastries that has maple in it you bet I am going to get it. My favorite maple item to eat is Maple Leaf Sandwich Cookies with a maple crème. I could eat the whole box of those cookies. When I hear anything gingerbread or maple it reminds me of the holidays. 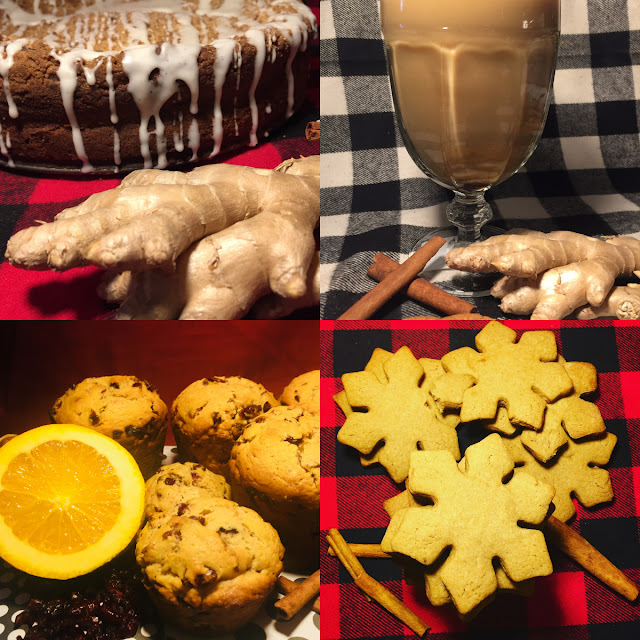 If you like gingerbread or any holiday spices as much I do, you might like some other recipes that I have post previously: Soft-Baked Speculoos Cookies, Spiced Cranberry Orange Doughnut Muffins, Gingerbread Syrup, and Gingerbread Coffee Cake. What is your favorite holiday favorite holiday flavors? Let me know in the comments. Here is what is happening in my neck of the woods, its snowing. It hasn't snowed in 9 years. I'll share a picture with y'all. 1. Preheat oven to 350 degrees. In a food processor or plastic ziplock bag crust gingersnap cookie into a course crumb. Melt butter in the microwave. Combine butter and crumbs then press into a 10 by 15 inch pan or jellyroll pan evenly bake in the oven for 7 minutes. The crust will be slightly browned. Let crust cool. 2. With a hand mixer or stand mixer, combine cream cheese, sour cream, sugar, sea salt, ginger, cinnamon, clove, nutmeg and two eggs until creamy about 2 to 3 minutes. Scrap the sides then add maple extract, vanilla extract and last egg until blended. 3. Transfer cheesecake batter to cool crust and smooth out evenly. Lower the heat to 325 degrees and bake for 25 to 30 minutes. Rotate pan halfway through baking. The cheesecake will slightly giggly, that's okay. It will firm up as it cools. 4. Turn off oven and open the door letting the cheesecake cool for 30 minutes. After cooling for 30 minutes, transfer to a wired rack and let it cool for 1 hour to 1 1/2 hours. Cover and place in the refrigerator for at least 6 hour or even better overnight. I love those two flavors together as well - maple and gingerbread - yum! These maple gingerbread cheesecake bars look delicious! What a great holiday dessert! These Maple Ginger Bread Cheesecake Bars sound so tempting. I can imagine the aroma and the flavors in them. Absolutely yum. It's absolutely looks delicious! I would love to try this Maple Ginger Bread Cheescake! I love this recipe and the combination of maple and the gingerbread is making me so hungry right now. My favorite holiday flavors are cinnamon, nutmeg, and orange. Great post - will try this recipe soon. Do you live in Texas? I'm in Houston and it snowed last night (about 2 inches) and it was happening while I was putting up our Xmas tree. What a fantastic sight and night! I'm in Louisiana. Where I live we got maybe 5 inches of snow. It was awesome to see that happen. It is one of the reasons why I like to read your recipes, I always learn something new! My favorite holiday,and actually anytime of the year is pumpkin and cinnamon. There is something about those two flavors that aRe very comforting. Just this morning, I made French Toast drizzled with cinnamon powder! As usual, your recipe looks delish! Oh! My mouth is watering! Stealing this recipe to try out this weekend! Maple isn't really a flavour we get much in the UK, but they sound great. I might just have to hunt some maple extract down and give these a try! I totally agree on the ginger point - its so festive and Christmas-y! This sounds like a really interesting flavor combination- I'm a huge fan of ginger during the holidays, so I have a feeling I'd enjoy this recipe! These sound so good! Will be adding to my recipe list to try for the holidays. I have not had ginger and maple together. Looks tasty. My favorite is peppermint for this season and all year round. Anything maple, or caramelle flavor is sure to be a hit in our home. For a lighter flavor, I tend to make lemon squares and cookies. Those look amazing!! Wish I wasn't vegan so I could bake them. Love the fresh ingredients. Yum. This recipe sounds amazing. Will definitely be making these bars in the holidays. Thanks for sharing.! I think I like the same flavors as you do just that we don;t have ginger in our cookies. We add clove, nutmeg, honey, cinnamon, pepper, vanilla, flavors like that. I feel like running to the kitchen to bake some cookies! This looks so amazing! I'm saving this and making it this weekend! Cannot wait! My Mom used to make gingerbread come each Christmas. I should start making them myself too! This recipe you have here looks and sounds (and I bet smells!!!) amazing. I've never been a huge fan of ginger so I'm trying to put it into yummy foods so I can get used to it. I'm so happy to see a recipe with actual ginger being used, not extract! this looks amazing! will have to try! These look SO GOOD! So perfect for the holidays!! My mouth is watering looking at the photos! These look aaaahmazing! Love ginger and the addition of maple is genius! These look delicious. I like the flavors, they are great for this season. I have been reading your recipes, all of them are amazing. Will be trying for sure! The ginger cookie base and spiced cheesecake filling sounds delicious and I can't wait to try it. Cheesecake anything! Give it to me! Also, the ginger cookie base sounds delightful! I have never tried anything like it! I must say the maple gingerbread cheesecake bar looks so healthy. I think I could eat them without that guilt I usually feel when I am enjoying cheesecake. I will give it a try. I love that this only takes 20 min prep. Gingerbread is one of my favorite things but I tend to shy away from things that take forever to make. I'll bookmark this to make it when the grandkids come to vist. These look so warm and comforting. I'm trying to figure out how to make more egg-nog themed baked goods. Okay come to my house and bake for me! You are just killing it with these holiday recipes! Again, adding this one to our family weekend baking party! Wowie. So Yummy looking. Are you a gourmet cook? These look like knockout treats. Yum! This is a great combo of flavors. I love gingerbread and can't wait to make this!! What a creative desert! It's great for winter too! Wish I had some now!!! Gingerbread is actually my favorite holiday favor. So you really nailed it with this combination! I love the maple and ginger flavor combination. Oh i have never tried a gingerbread bar. This is perfect for family dessert. Oh my goodness, this looks so delicious. I am trying to quit the sweets but I don’t know if I can wth this. I want to try this so much! I do love maple, and these sound so amazing! I can't wait to try and make them on my own. Yum! !